Day 1: Meet your guide in the Hotel L’Arve, Chamonix, attend an apero in the lobby at 16:30, dinner and equipment preparation and tour review. Day 2: Ski the famous Vallee Blanche. Ski lifts and a tram access the run. 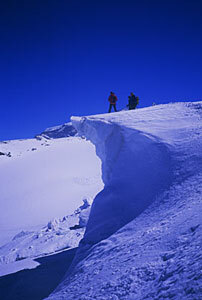 The rugged glacier terrain allows you to get ready for the type of skiing you wish to go into or just enjoy the ride. Surrounded by the most spectacular mountains in Europe. Day 3: Ski the Grand Montets. Transfer to Verbier after a good day of skiing. 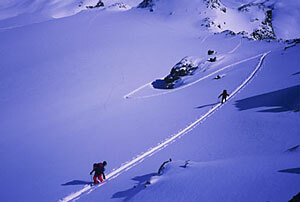 Day 4: Ski all day in Verbier from the top of Mont For to Lac de Cleuson, stay at the Mont For Hut. Day 6: Skin up apprx. 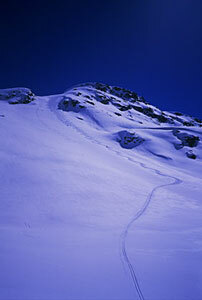 4 hours to the Le Parrain and ski down to Fionnaz, one of the best ski descents in the Alps. Transfer to Zermatt. Day 7: Ski Zermatt. 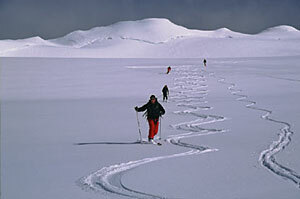 Depending on conditions, ski the Schwarztor to Zermatt. Day 8: Ski down to Cervinia and back to Zermatt, skin up to the Cima di Jazzi or Heliskiing the Monte Rosa. We are flexible in our schedule or where we ski. We only go where the snow is good. 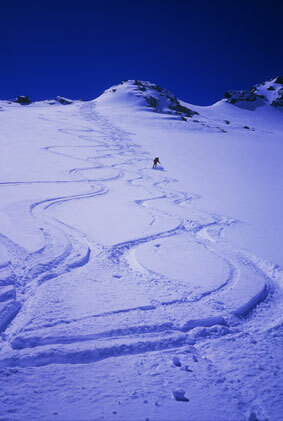 Upon request, we can start anywhere: Andermatt, Zermatt, Grindelwald, Verbier, Chamonix...your choice! January, February, March on requested date! Not included: Travel expenses to and from the meeting place, no travel expenses like train/taxi costs during the tour, lunches, drinks, no dinners in towns, rental equipment and souvenirs. Maximum comfort in hotels and huts, maximum safety, maximum view, maximum powder snow, maximum après ski, minimum packs: the recipe for an unforgettable experience in the European Alps. 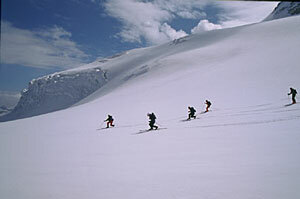 This is a customized, moderate to extreme steep skiing adventure. 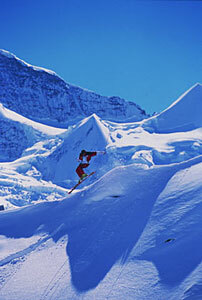 We help you have a great time whether you are a moderate or extreme skier. 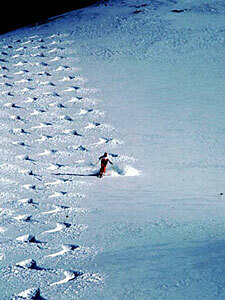 Everyday we adjust the skiing and hiking to your daily form. Participants must be strong skiers, PSIA level 8-9, able to perform strong dynamic parallel turns with alpine skis, telemark skis or randonne equipment, while carrying a small pack in all snow conditions: powder, hard packed and crud snow. 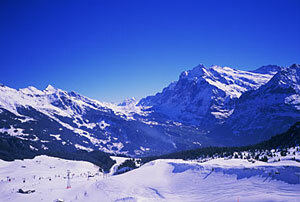 I strongly recommend alpine skis or randonne equipment for a trip in Europe. My past experience tells me that even an expert telemark skier will struggle and have a hard time skiing with a backpack and deal with the always-changing snow conditions. Telelmark skiers are naturally welcome, but we will merely have to adjust to his or her pace. You should be able to master steep uphill skiing techniques, have experience with ski crampons as well as Euro-uphill kick turn in all conditions. This will help you enjoy the tour better. Bring only gear you are used to: broken-in ski randonne boots, the correct full skins, and used gear you know by heart. If you have any concerns about your level of skiing and/or mountaineering skills, please feel free to contact Swiss Guides.